Westhampton’s Finest Location: Handsome Brick & Wrought Iron Columned Walls Draped in Carolina Jasmine Add Total Privacy to This Magnificent Solid Brick Georgian w/ 5,500 sqft. of Phenomenal Renovations. This has been the Owner”s “Most Favorite Home” they Have Ever Lived In! So Livable & Comfortable, Very Open Floor Plan For Entertaining, Tons of Light, Great Proportions Rooms, High Ceilings & Convenient to Everything in Town! Elegant Two Story Center Hall, 3 Fireplaces with Gas Logs, Lots of Beautifully Appointed Custom Cabinetry & Bookcases Throughout, Handsome 1st Floor Library, Awesome Butler’s Pantry, Wonderful Kitchen Renovation that Opens Directly in Huge Family Room Wrapped in French Doors to “Tree Top” Deck, Tons of Privacy in The Upstairs 5 Bedrooms which Four Bedrooms offer Remodeled En-Suite Baths & Walk-in Closets, 2nd. Floor Laundry Room & Devine Screen Porch off Master! There are Two Staircases to Lower Level offering Family Room with 4th Fireplace, Game Room/Home Office, Caterer’s Kitchen, Great Hobby Room & Storage. Totally Re-Landscaped w/ Outdoor Lighting & Irrigation. 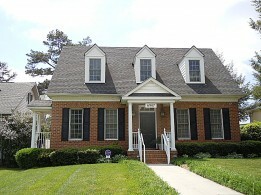 You will Love Being on the Corner of Old Mill Road for Additional Access to Town!